La Orquídea Lux mansion for rent in Havana. Rent a private Mansion in Havana, Cuba. How many times have you wanted to find a lux Jacuzzi, vapour bathroom, hydromassages, international phone and fax, internet service through prepaid cards and much more in a private mansion in Havana city? We have all these amenities for you in our mansion. 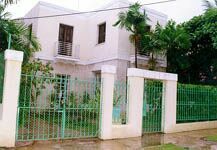 "La Orquídea" mansion is located in a tranquil and centric zone of "EL VEDADO" at less than five minutes from the biggest Hotels of Havana City. New option ALL INCLUSIVE in private accommodations in Havana.